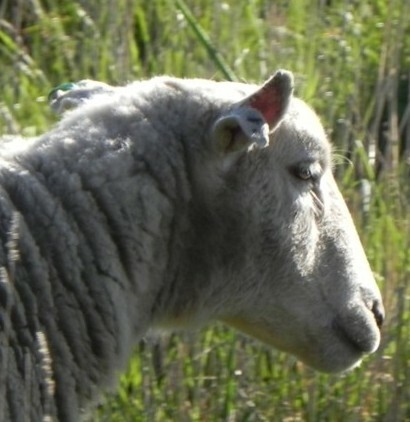 Ear tags for breeding ewes are often torn out of the ear, losing the animal’s individual identification as well significantly damaging the ear. Severely torn ears are all to common, apart from the welfare issue, the idenfication is lost. It may be more practical to put identification devices on a collar rather than the sheep’s ear. At Moffitts Farm we are trialing collars as a more welfare orientated and long-term solution to individual breeding ewe identification. Collars ( human belts imported from China) with multiple holes are ideal for attaching the NLIS button tags (or compulsory PIC tags) and a visual management tag. We are also trialling a bell (from France) on the collar during lambing as a warning system about the presence of foxes or dogs attacking lambing ewes. 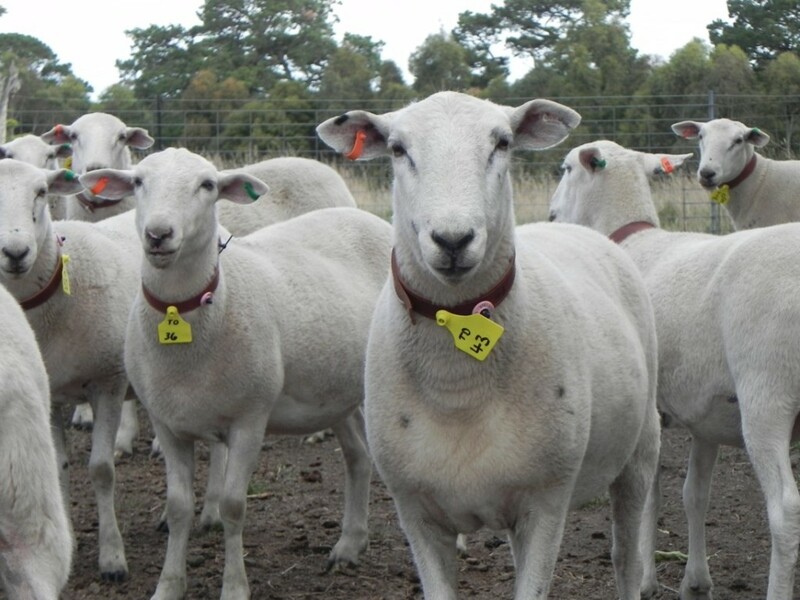 A management tag attached to the collar is easily read from a distance in the paddock, so identifying a ewe for birth number, for ability to shed wool, for conformation faults, or predisposition to disease is much simpler. It is anticipated the collars will be reused. 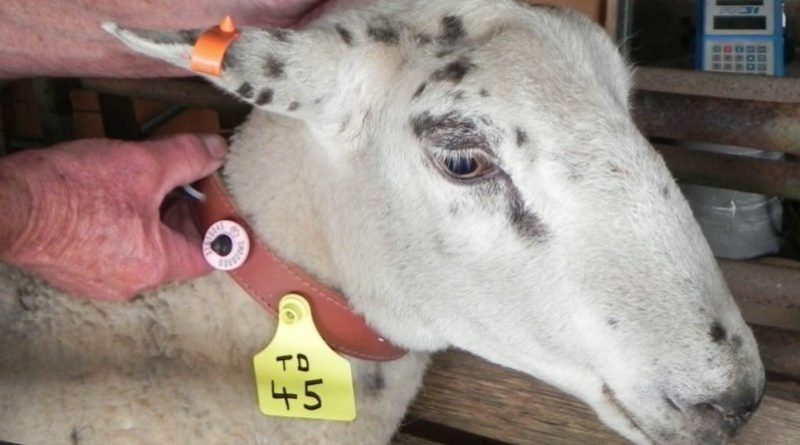 It is hoped that if and when ewes are sold for processing the tags on the collars can be monitored in the same way as those on the animal’s ear. Collars should be able to be collected from the abattoir. The test Chinese belt collars worked well for recording what is happening with each ewe during lambing. The buckles were not entirely satisfactory as they were relatively loose. Two collars fell off, but their bright coulour plus the yellow management tag made them easy to spot in the paddock. This year we decided to collar all the breeding ewes. 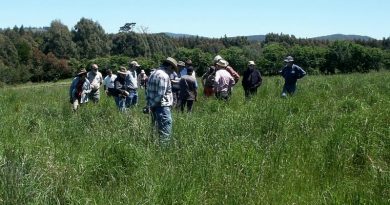 With Wiltipolls having easily read management tags will be usefull for recording their wool shedding ability – we want to retain ewes that are full shedders as well as their progeny. 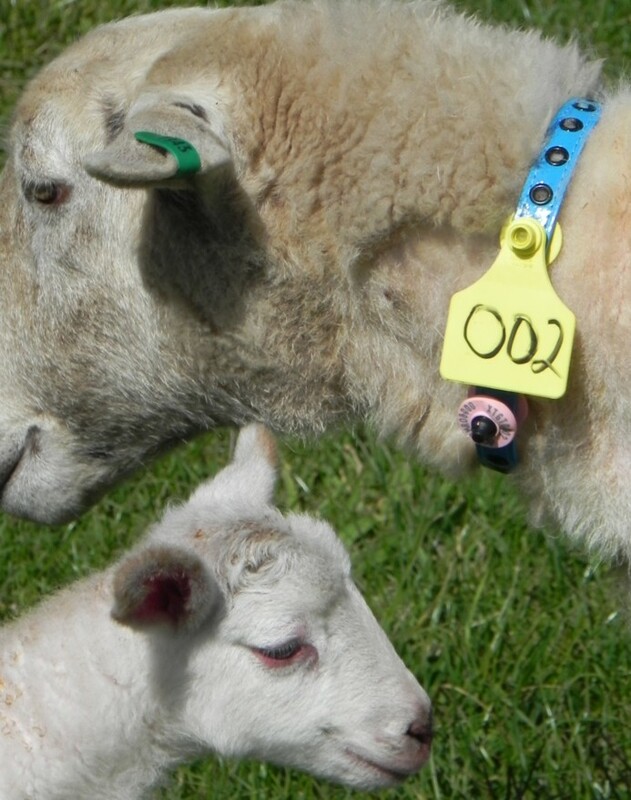 The collars are a great tool at lambing for identifying ewes with birth number and any problems. The electronic tags linked with management tags will make computer record keeping farm simpler. We recently came across a box of leather belt material which was unwanted, perfect for collars. This time I used electrical ties to secure the collars on each sheep. If a collar needs adjusting the tie is cut off and replaced. Multiple holes were placed in the collars to provide for adjustments. I am very impressed with the collars for animal identification and subsequent management and selection. It makes it very easy to keep an eye on animals that may have a problem or for connecting ewes to lambs (eg twins or singles) and ewes for quality of lambs, even without identifying the lambs. We now note down which ewes are rearing the best lamb(s) etc. We have Wiltipolls which shed their wool so shearing is not undertaken. I suspect collars would need to be removed for shearing. The collars we use are leather and I drill holes in them and use cable ties to secure the collars. I recently came across undoable cable ties which are a great help for adjusting the collar – which we sometimes do but generally I leave them loose to accommodate winter wool growth and spring wool shedding. Ordinary cable ties work well and can be simply cut to remove or adjust the collar and a new one added. Apart from the management tags we attach to the collars we are also attaching an NLIS tag. We will eventually have an NLIS tag reader attached to scale and drafting race. I like to keep tabs on livestock weights. Because we have some threat of dogs from the nearby Romsey township, I also attach bells to the collars of 10 or so ewes. The bells came from France, India and Mongolia (I asked family members travelling to look out for them hence the variety). The bells are very useful to detect unusual movement in the paddock as you can tell the difference in ringing between animals grazing and animals running. We needed to source new leather for collars in 2014. Saddlers do have leather strips but I found it can work out at around $6 per collar. I eventually came across a hide tanner in Ballarat (Greenhalgh Tannery 5342 4304) who sells full and half hides. I purchased a half hide which he cut into 3cm wide strips which will make around 100, 55cm long collars at a cost of around $2.10 each. I found 55cm length enables plenty of adjustment for our biggest ewes which weigh up to 90 kg. It also give room for wool growth in winter. We don’t put collars on replacements until they are selected as hoggets. I am also putting a DPI PIC tag on ears as eventually cfa ewes will have to be sold. The collars will be reused. I am using the same colour for management tags as for year of birth PIC tags and NLIS tags, so it is very easy to identify age of each animal. The leather collar retention has been good. I initially tried some cheap synthetic belting but they deteriorated over 12 to 18 months and broke – you find them in the paddock every so often. No leather collars have broken after approximately two years. I suspect wool lanolin helps preserve them. I need another four or five years of experience to tell the full story about collars, but so far I am very pleased with them for management as well as animal welfare reasons. Discarded belt leather is being tested as a collar to carry the NLIS tag and the management tag. Management and NLIS tags on collars make record keeping far simpler. The original belt collars were OK but the buckles could come loose. Can you send me information about your sheep collers please & how much & how I can purchase them please? 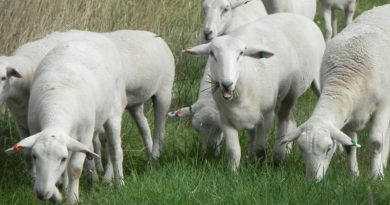 We source out sheep collars from Greenhalgh Tannery Pty Ltd in Ballarat Victoria. The tannery cuts the hide into 3cm wide strips. I cut the strips into 55cm lengths which suits our ewes. I drill holes in the collars and use releasable cable ties (sourced online from http://www.pacificcomponents.com.au ) to secure the collar. Releasable are great as it makes it easy to expand the collar if needed. Another hole is drilled in the collar and the plastic management tag is secured into that. The management tag colour coincides with the year ear tag colour. What makes collars cost effective is sourcing the tanned hide. Half a hide makes about 40 – 60 collars and costs around $3 per collar. We loose approximately 3% collars each year but often find them in the paddock. We use electronic each tags as primary identification of ewes. So if we loose a collar we can keep track of the ewes id.